As we commemorate the 900th anniversary of the founding of the Order of the Knights Templar, we also renew our commitment to the same principles that inspired the early knights: protecting Christians at risk, particularly in the Holy Land and the Middle East, and in keeping the road to Jerusalem open to all people. This core mission shapes the relationships formed through service and diplomacy and invigorates our efforts of charity and engagement in works of peace and reconciliation. The Jerusalem Mite serves as an arm for that charitable work, aiding persons at risk in the Holy Land through programs of affordable housing, accessible health care, refugee assistance, orphanage support and educational opportunities. In support of the Mite, there is a tradition at Grand C&Is of holding both Silent and Live Auctions and Milwaukee will be no different. But there will be a new twist to the Auctions this year – an Auction Catalog. Through the Catalog, we hope to peak your interest in the fabulous items on which you will have the opportunity to bid. The catalog will include an item number, picture and description of each item. Bidding and payment instructions for both Silent and Live Auction items will also be included. All items up for bid have been generously donated by your fellow Templars and other sponsors. 100% of the funds raised at this event will go to support the Jerusalem Mite. The catalog will be included in your welcome packet upon arrival, to give you plenty of time to review it and make plans to place your bids! Many of you are familiar with the Templar-themed paintings of Chev. Wilmot H. Phillips, GCTJ, CMTJ, well-known architectural artist. 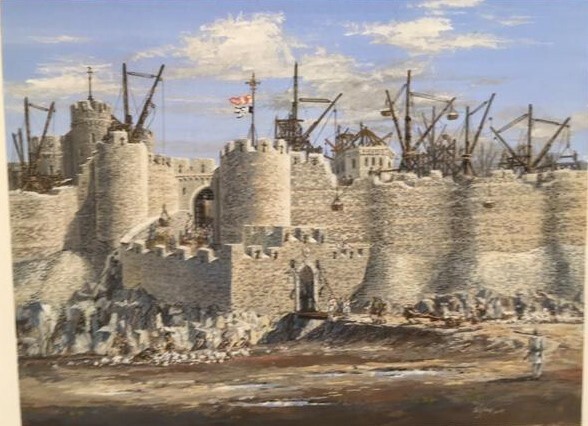 Will has done various paintings of the Holy Land and other landmarks associated with the Templars. His paintings have been auctioned at many a C&I, but not for the past few years. We are proud to announce that once again, an original Wil Phillips painting will be auctioned in Milwaukee. The theme of the painting, pictured above, is the 12th Century Templar Castle in Tomar, Portugal. 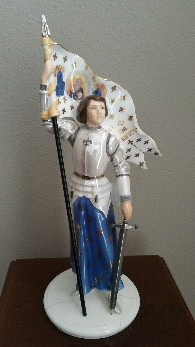 One of the Silent Auction items that will be available at the Silent Auction is a beautiful and exquisitely detailed Royal Doulton Figurine of Saint Joan of Arc. This is truly a high value work of art. Saint Joan of Arc (1412-1431 AD) is one of the most famous historical figures of chivalric knighthood in human history, with a real-life story of a Holy quest, driven by divine visions and prophecies, and the purest of devoted faith, combined with astonishingly superior military prowess which resulted in major victories. Just as the true history of Mary Magdalene proves that women can be religious leaders, the history of Joan of Arc proves that women can be monastic warriors, on equal footing with men as their counterparts. These historical precedents, which are further supported by the traditional doctrines and teachings of the Knights Templar, are reflected in the Order’s welcome and encouragement of full participation of women, whether as Clergy or Dames. Notre Dame Cathedral in Paris, constructed by the Knights Templar, features a statue of Joan of Arc, which portrays her with some indication of a Knights Templar affiliation. This iconic statue shows her with a distinctly Templar sword, in the original 12th century form, which is markedly different from the French swords used during her time. Her battle flag is mounted on the lance in a manner reflecting the Agnus Dei seal used by the Templar Master of Provence. The figurine that is up for auction was based on the statue in Notre Dame Cathedral in Paris. It bears a crusading sword in Joan’s left hand with handle up to represent the cross of Jesus. In her right hand she holds her battle flag. Michael Doulton, 5th generation descendant of John Doulton who founded the Royal Doulton Company in 1815, indicated that a statue of Joan of Arc was chosen to be made because of the Saint’s popularity in England and around the world, especially in military communities. Michael indicated that this figurine rarely comes to auction. Milwaukee Wisconsin also has a connection to Saint Joan of Arc. In the center of the Marquette University campus, beats a sacred heart born in medieval France. The original Saint Joan of Arc Chapel, begun in 1420, was relocated from France to Long Island, New York in the early 1930’s, and was later moved to Milwaukee in 1964. Joan of Arc reportedly prayed at this Chapel just prior to her victory, breaking the siege of the City of Orleans on May 8, 1429. A visit to the Chapel will also allow you to experience the “Joan of Arc Stone” for yourself. The stone is believed to be one upon which Joan prayed for success before that battle in 1429. The stone, reportedly kissed by the lips of the saint, sits at the base of an opening behind the altar. Legend has it that the stone is always colder to the touch than those around it. You can verify that legend by visiting the Chapel, but since it is closed for Memorial Day weekend, plan on arriving early or staying late. The Chapel is a mere 1.5 miles from the Pfister Hotel and tours are available Monday May 20 through Friday May 24 and again on Tuesday May 28 through Friday May 31 from 10 a.m. to 4 p.m. each day. Tours of the Chapel last about 30 minutes. There is no charge for the tour, but donations are accepted. 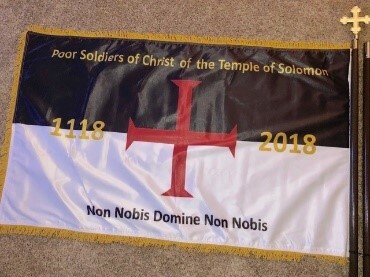 Another very special item up for auction is a beautiful 900th Anniversary Templar Flag, generously donated by the Priory of St. Thomas a’ Becket. This flag would be a prized possession for any individual or Priory. The flag measures 5’ x 3’. It is a two-sided flag with fringe on three sides, that waves proudly on an 8’, two-piece flag pole, topped by an ornate brass cross finial. 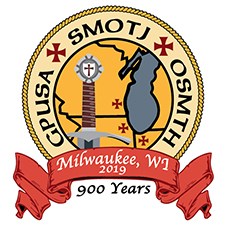 Watch for this flag at the 900th Anniversary Grand Prior’s Reception as well as at the Convent and Investiture. Be sure to bid on this truly once-in-a-lifetime keepsake of the Knights Templar 900th Anniversary! We look forward to your participation in the 2019 Auctions in support of our mission and the Jerusalem Mite. Plan to be part of the legacy. Plan to be one of the amazing donors who help to make our mission a reality. If it weren’t for you – we wouldn’t be able to do what we do! Thanks again and remember – have fun! According to the website statistics (where the Templar Times resides), since the beginning of 2019, there were 1,610 unique visitors who visited 2,388times and opened 4,278 pages, making the Templar Times a great PR vehicle for SMOTJ members! Keep reading and be sure to share your issue with Priory postulants or interested parties!